Fast tempo, high intensity and tactically savvy – all the traits you’d expect from a Pep Guardiola team – the only discrepancy being this was Celtic for over an hour, as Manchester City’s sensational 100% winning start to the season was halted in a feisty Battle of Britain. Offside in three minutes, but Celtic’s first ‘goal’ was allowed to stand. Pep’s previously all-conquering City leaked goals like a ruptured drain on a horrible rain-swept night in Glasgow. A clear offside decision that wasn’t called, a wicked deflection and Kolarov’s calamitous defending all combined to gift the lead to the Scottish champions, not once, not twice but a staggering three times. 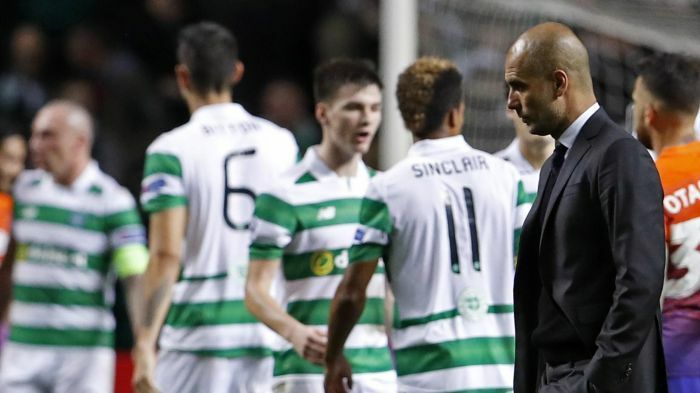 For once it didn’t go to plan for Pep as City’s 100% winning record ended in a 3-3 thriller with Celtic. More importantly City, deprived of goal-maker and taker extraordinaire, Kevin De Bruyne, struck back each time, in a pulsating encounter, fuelled by a cacophony of feral Glaswegian howls. The green and white masses were baying for English blood, albeit Raheem Sterling was the sole Englishman bearing City’s garish orange and purple colours on his chest at kick-off. Sublime Sterling – Raheem is City’s man of the moment. City’s standard-bearer from south o’er the border, Sterling was sublime, confounding the critics who have long sought to assassinate his character, his performances, his very essence, since he had the ‘temerity’ to leave Liverpool and the Scouser’s sour-faced, bleating boss, Brendan Rodgers. Scorer of City’s second equaliser on the night, Sterling has benefited more than any other player from Guardiola’s inspirational guidance, but it was Rodgers who had most to smile about after the evening’s entertainment was done. Sterling return – Raheem scored with another super cool finish to make it 2-2 in Glasgow. 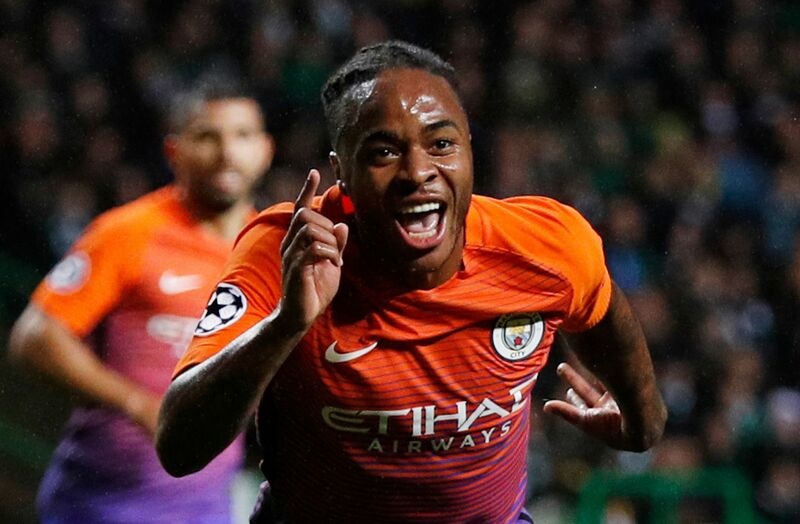 As City buckled at times under the unexpected ferocity of Celtic’s attacks, Sterling emerged with his rapidly rising stock more than intact, on a night of unpleasant surprises. If the plan had been to keep the home side’s ’12th man’ subdued, it unraveled horribly when the hosts scored inside the third minute in blatantly offside fashion. Celtic Park erupted – it was as if they’d gone back in time to 1967 – when the ‘Lisbon Lions’ were crowned European Champions. Kolarov calamity – misfiring AK47 presented Dembele with the chance to put Celtic 3-2 up. All that was missing was Mel Gibson as William Wallace, in full Braveheart regalia, as the epic battle unfolded. 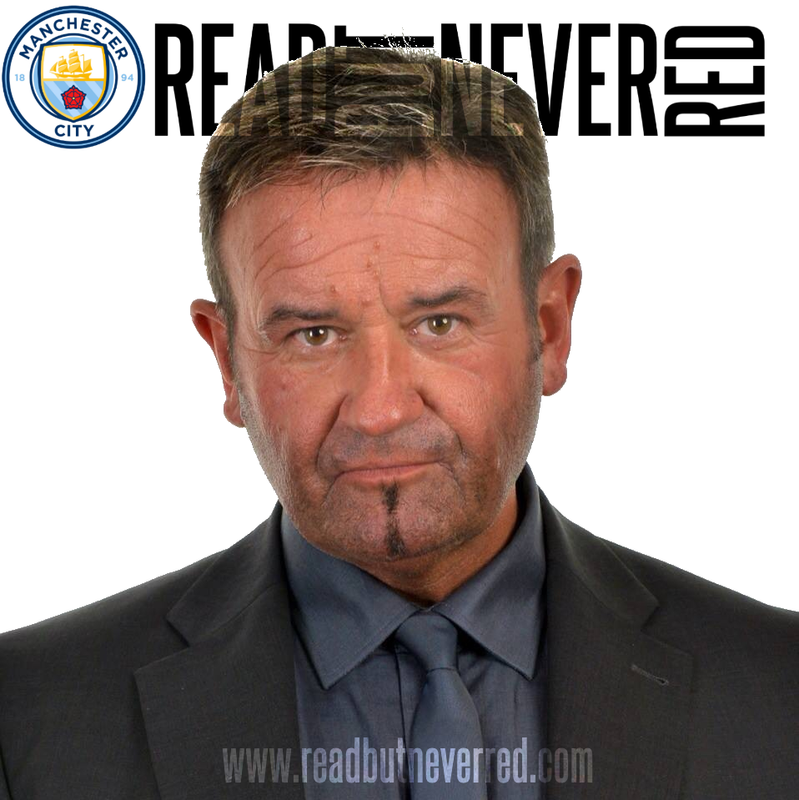 It was to be a match where City, having conceded just six times in 10 games, contrived to haemorrhage three inside a barmy 47 minutes, clearly illustrating where Pep needs to spend tens of millions of pounds next summer, if not before. Perversely, ‘sweeper keeper’ Claudio Bravo – who has yet to win over a number of City fans and Joe Hart ‘loyalists’ – was blameless on all counts. 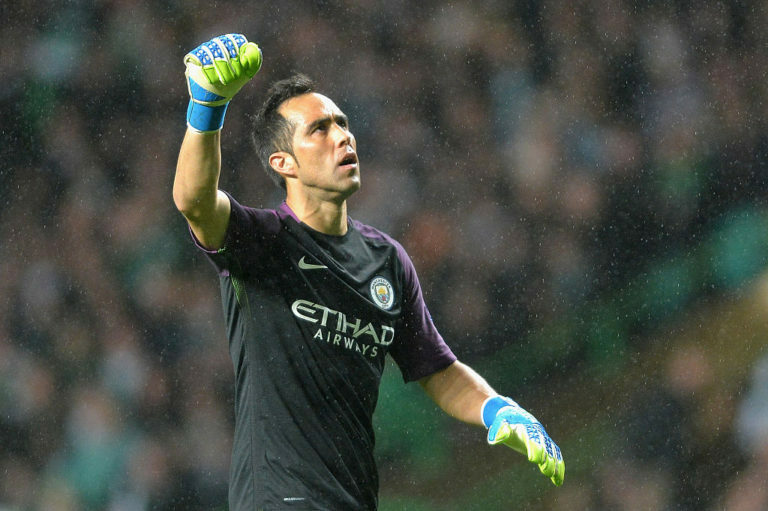 Beaten three times on the night, but Claudio Bravo wasn’t to blame as City leaked goals in rain drenched Glasgow. The veteran Chilean is clearly still finding his feet in the hurly burly of the Premier League, but those feet look increasingly assured, with a high percentage of pinpoint passing and sound distribution. It’s the City support who need to adjust to the sight of their keeper and defenders playing ‘football’ in and around the penalty box, rather than hoofing the ball away and invariably surrendering possession. Not always good for the heart, and certainly not good for the spurned Joe Hart, Bravo will show his pedigree and win over the doubters in due course. How often will City score three away from home and not take the win? Whereas Hart is still on City’s books, ex-Etihad men Kolo Toure and Scott Sinclair rose to the task of trying to damage their former employers. Kolo looked like a man on a mission for his exiled brother Yaya, as he produced a solid showing, not often seen in a City shirt. Sadly, the man presently residing in the centre of City’s defence, Aleksander Kolarov had his worst game since Guardiola rejuvenated his sky blue career. 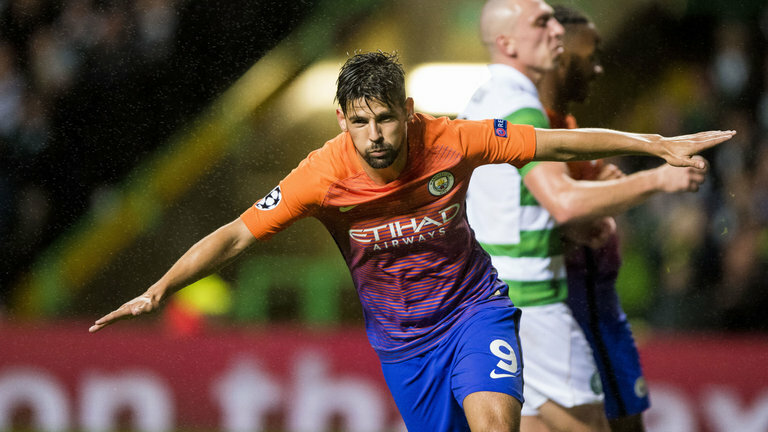 Nolito interrupted his domestic ban to interrupt Celtic’s celebrations when he scored City’s third equaliser. It was the misfiring AK47 of old who committed a defensive howler, presenting Dembele with the opportunity to fire home Celtic’s third goal. It underlined Pep’s misjudgment to keep John Stones on the bench – possibly with Spurs away on Sunday in mind – and the need to entertain a big bid for Leonardo Bonucci of Juventus in January. 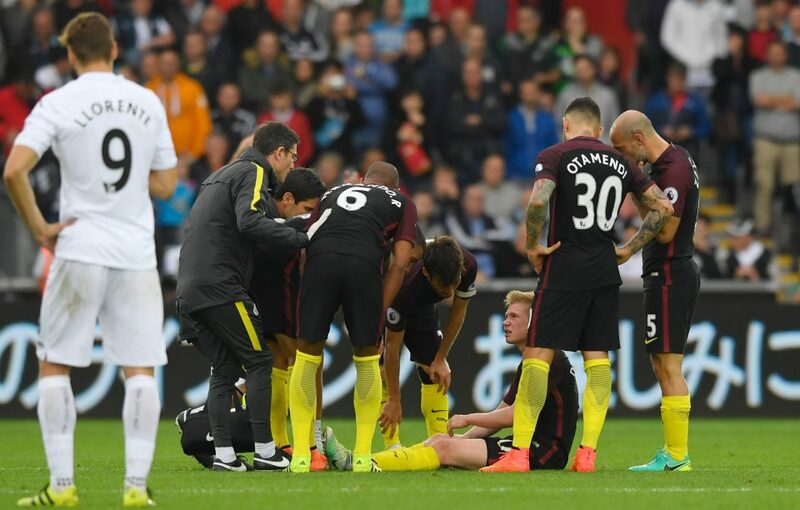 If the beleaguered Vincent Kompany cannot rid himself of constant injuries, a new leader is imperative in City’s back line. 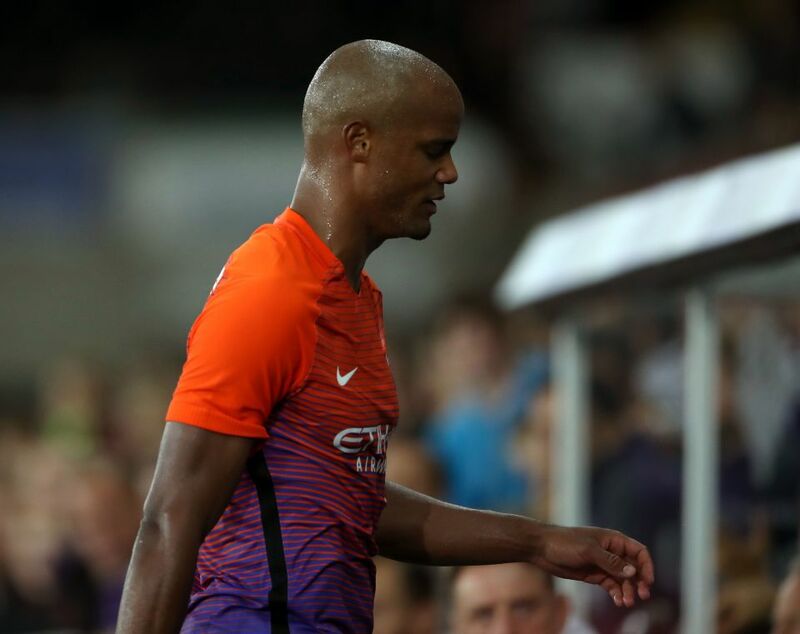 Bad Kompany – City’s injured skipper leaves the field at Swansea with minutes to go in the Blues 2-1 League Cup win. The positions of ageing full backs Pablo Zabaleta and Gael Clichy will come under increasing scrutiny and an injection of youth and pace would be more than welcome, perhaps in the shape of Arsenal’s Hector Bellerin. Celtic, punching way above their weight, made life uncomfortable for a good 65 minutes, as indeed Swansea had done in the first half of City’s eventual 3-1 Premier League win last Saturday. A willingness to hustle and harass Pep’s imperious playing style, appears to offer opponents the best chance of blunting City’s attacking weaponry and threatening a still vulnerable defence. 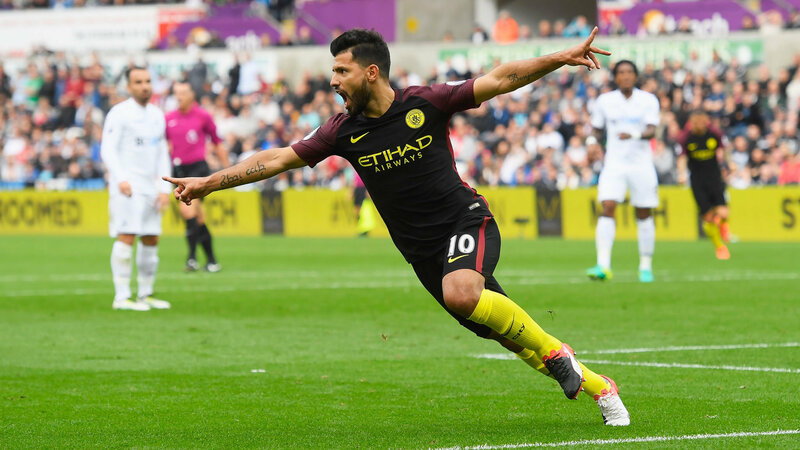 28 goals in his last 27 Premier League appearances – City will be hoping Sergio continues his strike rate against Spurs. Sad to say, that even with some very astute summer signings, City missed the mastery and commanding influences of Belgian duo Kompany and Kevin De Bruyne. Pre-match talk of a City goal fest in Glasgow was washed away by a tenacious Celtic resistance. Nonetheless, it’s a game City could and should have won. Credit to the Scots who proved Aristotle’s concept of the ‘whole being greater than the sum of its parts’. Badly missed – Kevin De Bruyne’s goal making and taking talents were absent at Celtic Park. Who’s to say Barcelona and Borussia Moenchengladbach will not experience similar discomfort in such hostile surroundings? Any travelling Spanish and German support will probably suffer the same fate as the nigh on 3,000 City fans, who queued for up to two hours in the cold and wet, to collect their prized match tickets. The pros & cons of the European away match ticket policy are very much up for debate, after a somewhat shambolic distribution exercise. Will Barcelona and Borussia Moenchengladbach fans suffer the same fate as City supporters who had to queue in the rain for hours to collect match tickets at Celtic? It’s one thing ensuring tickets only go to the named ticket holder, but quite another when loyal fans are treated like cattle when seeking to collect. 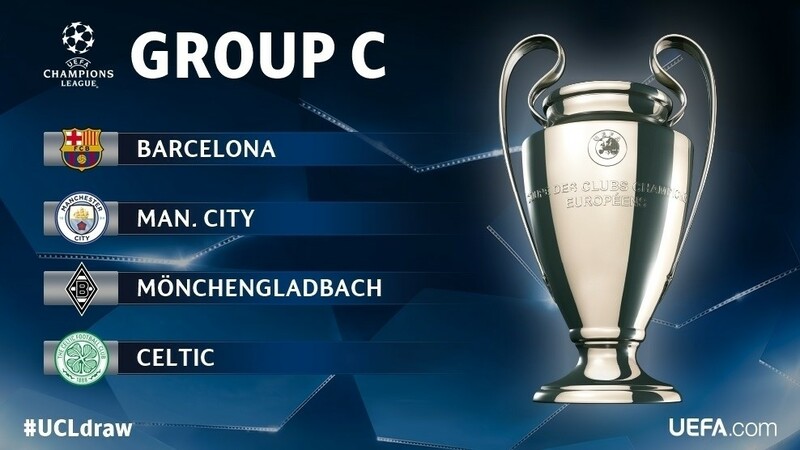 Whether or not City stand alone as being culpable of not being capable of organising the proverbial in a brewery, or other clubs are similarly incompetent across Europe, it needs remedying before Barcelona and Moenchengladbach away! Brazilian sunshine – Fernandinho helped warm the hearts of City’s wet and weary fans with the first equaliser at Celtic. Thankfully, away days to Wales proved far less problematic both on and off the field. Back-to-back wins over Swansea in the League Cup and PL had taken Pep to a perfect 10/10 wins, but the 3-3 Champions League compromise, meant the Spanish guru fell one shy of the record of 11 straight wins in all competitions from the start of a season. Up & Coming – Aleix Garcia opened his goal scoring account in City’s 2-1 EFL win at Swansea. But Guardiola isn’t focused on records, he, more than any other manager concentrates on style and substance. He’ll need both in abundance when City face what is, theoretically, their toughest game of the season thus far on Sunday. Trips to White Hart Lane have been unpredictable and often lopsided affairs in recent times, with City running up 5-1 wins under Mancini and Pellegrini, but the same Premier League winning managers, suffering heavy defeats ‘darn the Lane’. Referee Mark Twattenburg aided and abetted Spurs’ 4-1 win last season in no small measure with two blatant offside goals being awarded to the hosts. Head-scratcher and visually impaired – Marriner possibly wondering where he left his guide dog before kick-off at White Hart Lane. 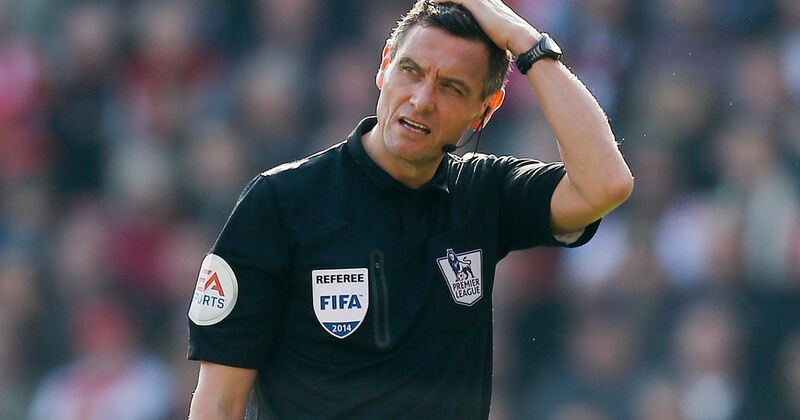 City have every right to fear the worst this time around, with the visually impaired Andre Marriner officiating. Marriner infamously claimed not to have seen the controversial ‘elbowing incident’ – which led to Sergio Aguero’s three-match ban – after City’s 3-1 win over West Ham. One can only hope that Marriner’s guide dog can keep up with the run of play at the weekend! Even with just six games played it’s a match up of the highest scorers (City with 18) against the tightest defence (Spurs conceded 3). 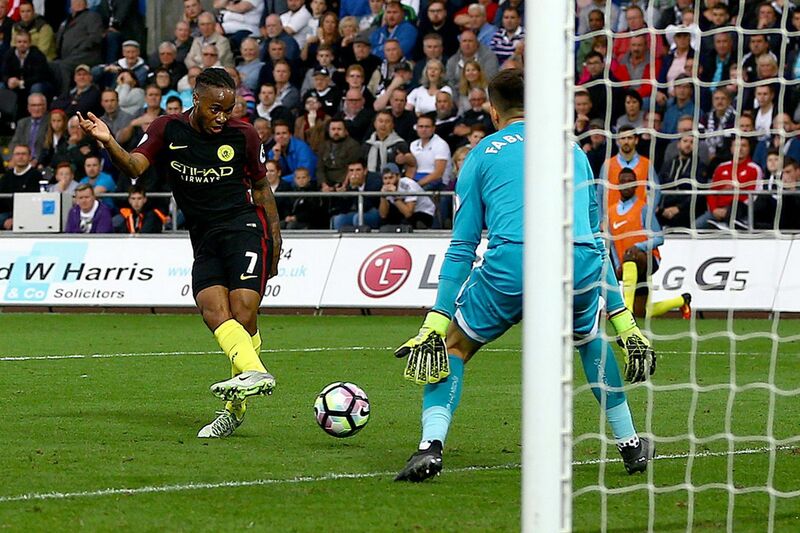 Sterling on the rise – Raheem deposits the ball in the back of the Swansea net to secure the 3-1 win. De Bruyne, Kompany and Delph are all injured, whereas Yaya Toure can’t summon up the gumption or decency to apologise for his repugnant representative, Dimitri Seluk’s, anti-Pep and anti-City vitriol. Toure’s silence is far from golden and reflects his contempt for City and his misplaced allegiance to the yucky Ukrainian blob. The Ivorian would rather sit on his backside and take his wages under false pretences. 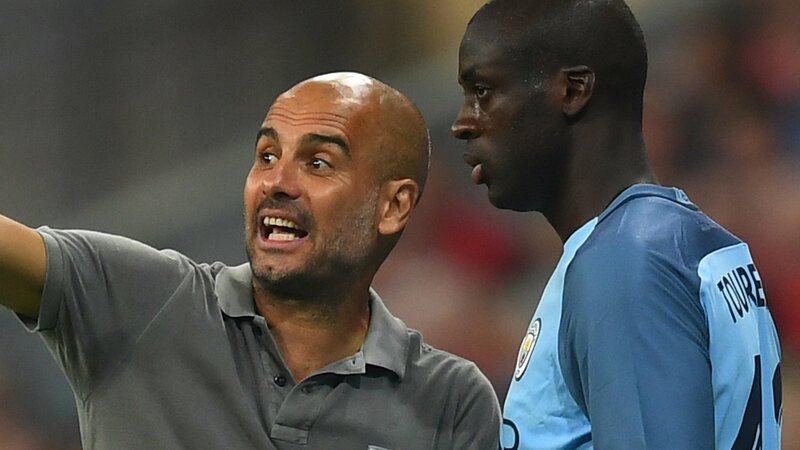 Silence isn’t golden – Yaya would prefer to take his money under false pretences than apologise for Seluk’s derogatory remarks against Pep & City. Spurs will be without Harry Kane, but armed with the on song South Korean hot-shot Son Heung-Min, Mauricio Pochettino’s team will want to cut City’s points lead to just one. If City can make it seven league wins on the bounce they’ll be seven points clear of arguably their biggest title challengers and in a sky blue seventh heaven. Dedicated to two true blues suffering the loss of much loved parents – a lady blue with the initials BX in a foreign land and, closer to home, one of the nicest guys you’re ever likely to meet, Ian Steggles. You’re in our thoughts during these troubled times. I would take a draw at the lane. Bravo worries me, but in Pep we trust. I like the dedication at the end. Come on City. Thanks Guv. Agreed a draw at Spurs - they're unbeaten too and one of our main title rivals - would be a great result. I think we all need to adjust our sets and try and stay calm about Bravo and, as you say trust, Pep's judgement. As for the dedications - I wish I never felt compelled to do them, because invariably they are dedicated to people who have either passed or are battling for their lives or grieving for loved ones. Agree with ever word Dave. Celtic will probably never play as well & hopefully we will never play as bad particularly in the first half. What really gets up my nose is the over the top reaction from some city fans. One actually said we should of won 7-0 easily. Anybody that thinks were going to batter every team & win ever match go give your head a wobble. Absolutely Doug - I mean what are these folk going to do when City actually LOSE - as we will at some stage? There are some right pillocks out there who have the mentality of Manchester United fans of old...no team has a divine right to think they should win every game. Let's be grateful for what we have at present and see where this inspirational manager can take us. Smash spurs I think. Time to show our class! Now that would be something and a seven point advantage over Spurs this early in the season would certainly be more than a little useful. We know they're a good team but we know we're capable of beating their best efforts. Just hope it's won on merit and not on the basis of anything to do with the dubious decisions of Marriner who, apart from his obvious visual impairment, wouldn't know the truth if it bit him on his backside. A draw would be a decent enough outcome. If you'd like to find out more please email back.